I had been asked a couple of times whenever I posted my Civ 6 maps or my Civ 6 city maps why didn’t I combine them all into the one map? Well, the simple reason is that right back at the start I tried but it just was not feasible. I had tried to add all the cities into America and they didn’t fit, which made the prospects of adding countries like France or The Aztecs next to impossible. However, After Rise and Fall was released and I went through and created a new map from the template I was working with I wondered if it was possible to upscale it to a size where I could fit in the Netherlands. The Netherlands was the most are compact civilization in the game so far so it became my bellwether and it worked and thus began the long, long process of putting this map together. This was a process with just as many success as well as failures, however after all that work, here it is. The first thing you will notice is the way this map is constructed is slightly different from the maps I have done in the past. 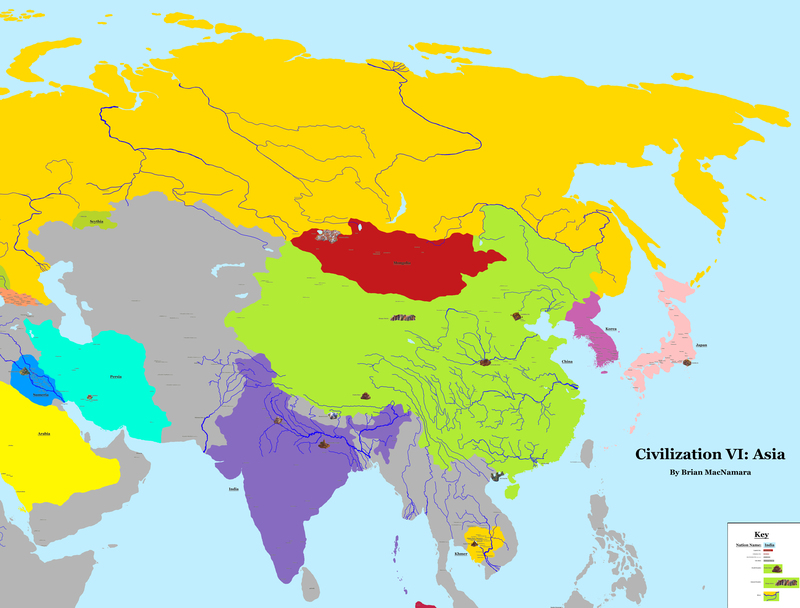 In those maps, the territory was based around the territory that existed when the civilization’s leader was alive. This was because the game was heavily designed around those specific leaders. While this was fine for my Civs map, with this map what I wanted was less of the chaos and more clarity. So with that in mind, I have reduced the territories down to a manageable size. This was mostly done by using the modern political borders where such borders exist, like with France and Japan. Now, this was not a perfect system (there is no perfect system every map choice has to make some compromises), and we will go into some of those problem areas as we progress. Just before we move on, there will be a lot of images incoming, so if you are on your mobiles now is the time to check you are on wifi. We begin our time exploring this world map by taking our first stop on the African continent and up into the Middle East. It is here where we get our first ‘problem area’ with regards to Arabia. Part of the new system in place with regards to the city lists is that the capital of the civilization when the leader was alive becomes the capital of the in-game civilization. So this means that for Arabia, instead of the traditional Mecca, it has Cairo as its capital city, Cairo the current capital of Egypt, Egypt which is also a civilization in the game. 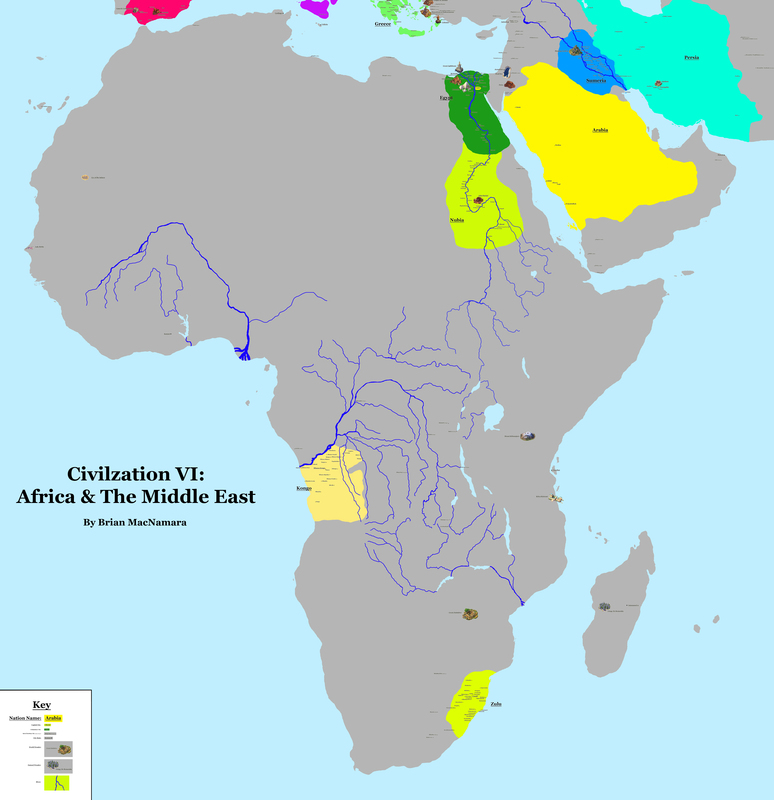 So we have our first compromise, with a yellow bubble around Cairo, also Arabia is one of the civilizations with the most cities outside of its territory which couldn’t really be helped. Another thing we see is once all the colonial possessions of England out Africa does become a bit more empty, well a lot more empty. However, there is still the traditional spots of Ethiopia and the Niger River civilizations that have yet to be filled which we may see going into the future. We also get to see the impact of the Nile River on at least two of the civilizations. Indeed it was the interactions of Egypt and Nubia along the Nile that first really pushed me to think about creating this map in the first place. Our next stop on our trip brings us to the largest continent of the world Asia, a place where we see much less grey than before. It is also here where we come across our next ‘problem area’ with regards to China. There is no map that exists today of a modern China’s borders that are not controversial in some way or form. This is put in stark relief when you see that a lot of Mongolia’s cities are in Northern China, namely in the provinces of Inner Mongolia and Xinjiang, two places that have been in the news recently for China’s practices in subjugating local populations. In the end, I went with the Modern China but not Taiwan approach and let’s see if I get any hate mail from that. This is also a good point to talk about rivers because as you can see here with Asia I kind of went river mad a bit when making the maps. Now as I mention with Africa, I was always going to have The Nile River in, but I thought if I was going to add The Nile then shouldn’t I add some of the other big rivers, and then I realised just how many of the cities appeared next to different rivers. This lead to one of the most time-consuming moments because none of the river maps I could find was in the same map projection I used for the big map. So to do this I had to puppet warp them into Photoshop before I could add them. This took so long that in some of the early versions of the maps they were even more pronounced then they are now. However, as I realised this was a Civilization VI map and rivers are not named in the game that I should dial it back … a bit … okay, they are still a bit much. 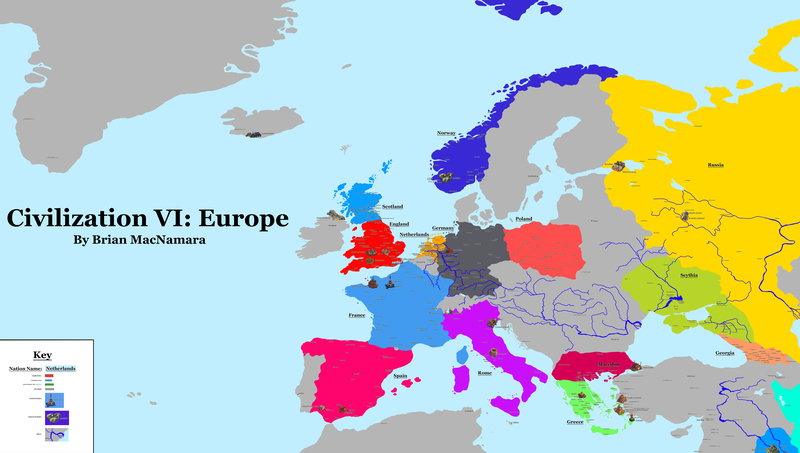 Now we come to the most complicated area that I had to make in the map, Europe, which has 14 of the 34 civilizations in the game (depending on how you define it, and if you count historically European Civilizations outside of Europe that number goes even higher). This leads to some difficult arranging in Photoshop, with issues like The River Rhine going across three different civilizations. So this is a good moment to talk about the map. It was originally created by the user San Jose all the way back in 2006 and uploaded to Wikimedia Commons where I found it in 2017. I originally just used the base map with Antarctica cut out, because when will they add anything there … However, when putting Rise and Fall together I became frustrated with the blocky edges, so I redid the outlines from scratch and recreated the map, only to find when I blew the map up to the size I needed I discovered that I had to redo it all again from scratch. Also blowing it up to this size I got to add a bit more detail that was missing, and you can see that in Europe with the Aegean and Adriatic Seas. Europe is also a good case study in how this map is better in some areas and not in others. So I really prefer how Macedon, Greece, and Germany turned out compared to my older maps, but I think the individual Norway and Netherlands maps look better. Europe is also where we had the most problematic ‘problem area’ when it came to how to adequately represent Greece and Macedonia on the map. As we mentioned back in our review of the Macedon/Persia DLC (see here) there is currently a lot of angst on both sides around the name of Republic of Macedonia. Indeed, if you want you can read all about it here. One of the issues is that Greece has claimed by calling itself Macedonia it has designs on the region of Greece called Macedon … and that is how it kind of ended up on this map. When I was putting this together, this was one of the only examples where keeping it to the modern country didn’t really work, first for the difference between the ancient kingdom and the modern country, and also because that would mean only one of Macedon’s cities would be inside its territory. Also, I am sorry Russia but you lost some of your territories to Scythia, and this is also a good point to mention that some of Scythia’s cities have changed locations because of new information I found when redoing this map. There is also Turkish no-mans-land which has Greek, Macedonian, Persian, and Arabian cities as well as some city-states. I have kept it grey rather than adding any of the other civilizations territories mostly because at some point we will get The Ottomans, Byzantines, or Hittites or all three. 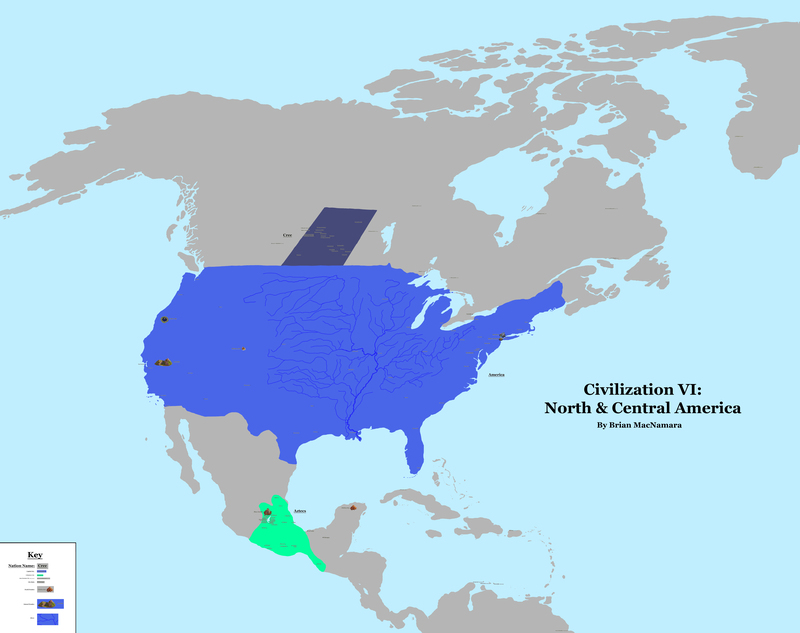 With North America, we have a map that only has three civilizations but it is still pretty full, and also a full of potential. When I made it the first thing I discovered is just how big the Mississippi River system is like I had no idea that Denver was a part of it, and that it even sneaks all the way up to Canada. It is also where no matter how I tried I could never get the Great Lakes to look quite right, and at some point, I just gave up. I mentioned back in my maps that it was difficult to work out what territory boundaries to give The Cree. In my other maps I based it around the different numbered Treaty areas, however, when I translated it to this map it looked off so I based it around the province of Saskatchewan. Also talking about The Cree I should mention that when I put those old city maps together in the past I didn’t actually document where I got all the city information. Which meant for this map I basically had to do every city on the world map from scratch again … I’m a little upset with past me for this oversight. As well as this, while I tried to get the Aztec cities around the lake area properly, in the end, some of them had to be moved to fit it all in, indeed Huey Teocalli is completely in the wrong spot, but it simply didn’t fit further south. 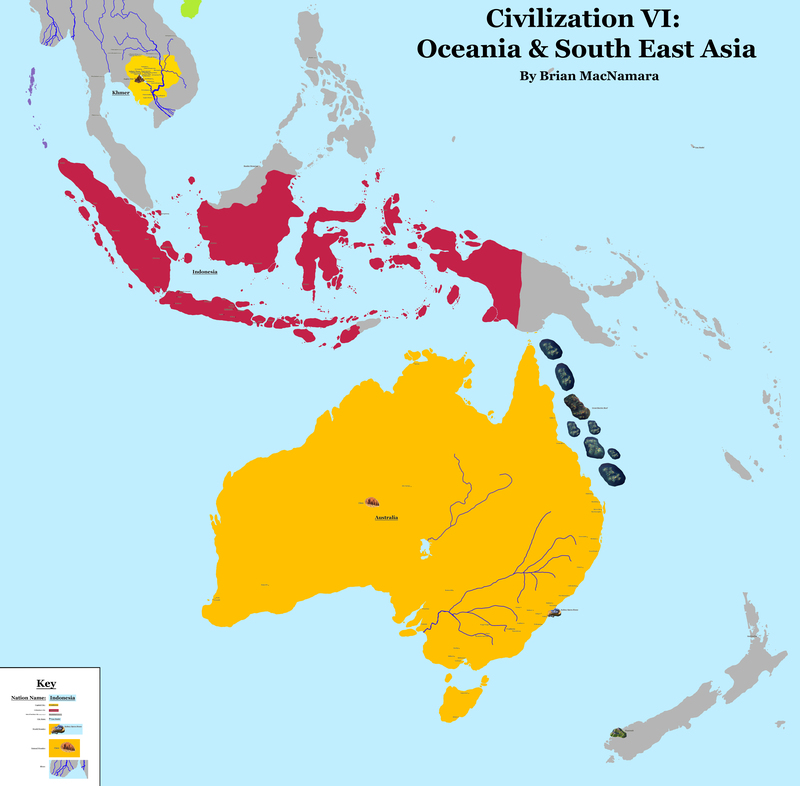 Historically, Oceania and South East Asia have been one area that Civilization has not really had a lot of focus, however, this has started to change with later games. In Civilization VI we have three civilizations with The Khmer, Indonesia, and Australia. When I was putting this map together I discovered right at the end that Photoshop only lets you output a file in a usable format if it was under 30,000 pixels. This meant cutting down the map where possible and also meant that after a lot of work in recreating Fiji it ended up being cut out, so sorry Fiji. As well as this, I found that the map didn’t really have a good version of New Zealand so I recreated it from scratch and I don’t think I quite got the ratio right. But given how New Zealand often gets left off maps, well giving it a bit of a boost is not the end of the world. Also Indonesia, why so many islands, so many islands. The final map on our journey before we get to the big one is looking at South America. 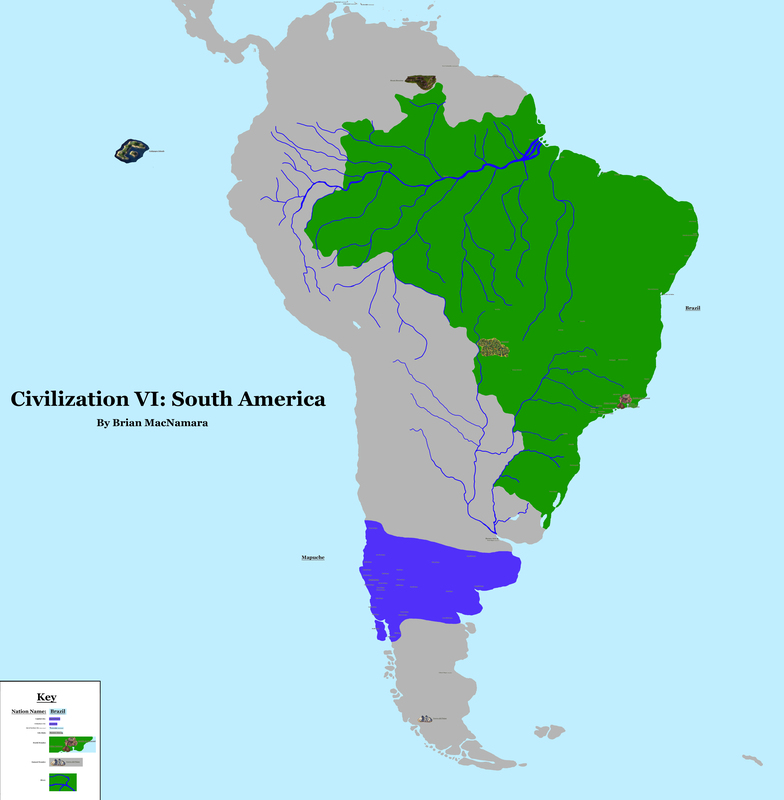 South America is a map that is quite interesting because it has the least amount of civilizations in the game with only Brazil and Mapuche. However, we also have four of the game’s natural wonders including for me the most spectacular Natural Wonder, Mount Roraima, which just looks amazing in-game. However, it is a region that does feel a bit sparse compared to the rest of the globe. And now after our trip around the world, we come back to the full map, where I thought I would give you a little overview. The map itself is 1.3 gigs large and takes 9.7 gigs to process it, and you can imagine that takes a toll on my computer. I wish I had tabulated how many hours it took to complete this map, but I would say that it was probably over a week’s work spread out over a month. It was a lot of work, but I am so glad that we got it all up in the end. There were a lot of false starts, and retreats, and reworking, and sure there are more things that couple be improved, but at some point, you have to say it is done. I hope you have liked it and when the next expansion pack/DLC get dropped I will be sure to update it. Have you seen any odd maps in Movies, TV or Video Games?, let us know in the comments below, feel free to share this review on any of the social medias and you can follow us Here. Check out all our past reviews and articles Here, and have a happy day. LacsiraxAriscal for reminding me why I stuck Chen where it was two years ago which failed my memory when I came back to it today. The CivWiki, for when at the end of the process of making this map I discovered all the wonders I had painstakingly edited out for my other maps didn’t work here and I had to do them all again from scratch. Well, they had a good repository of images so I didn’t have to go search through all my old saves to find them. Also Art of the Score, Movies with Mikey & Lindsay Ellis, for keeping me sane during some of the more tedious parts like going over Russia for the fourth time. – All Natural/World wonder graphics were created by the artists at Firaxis Games. – The World Map that we used as a base was created by ‘San Jose’ which is shared with a Creative Commons Licence. – The Nation detail maps America, Canada, China, New Zealand, that we used for reference were shared with a Creative Commons Licence or was in the public domain created by Antigoni, E Pluribus Anthony, Li Chao, NordNordWest. – The River Maps that we used as a base was shared with a Creative Commons Licence or in the Public Domain, Amazon, Amur, Congo, Danube, Dnieper, Don, Indus, Kuban, Lena, Liao, Mekong and Irrawaddy, Niger, Nile, Ob, Pearl, Rhein, Río de la Plata, Saint Lawrence, Tigris and The Euphrates, Volga, Yangtze, Yellow, Yenisei, Zambezi, by authors СафроновАВ, Francis McLloyd, Hel-Hama, Imagico, Keenan Pepper, Kmusser, Shannon1, Sting & Ulamm. Disclosure – I am a moderator on the site Civfanatics of which several staff and players are members of the ‘Frankenstein Testing Group’, Firaxis Games internal playtesting team. I am not part of this team nor do I have any links with Firaxis Games or 2K. This entry was posted in Articles, Map-It, Video Game Reviews and tagged cartography, Civ 6, Civfanatics, Civilization 6, Civilization VI, Civilization VI: Rise and Fall, Map, Map-It, Sid Meier's Civilization VI, Sid Meier’s Civilization, Video Game, video games by tldrmoviereviews. Bookmark the permalink.